Today and for the rest of the summer, I'm going to try to honor these brave Cubans by sharing their names and little about their respective stories. 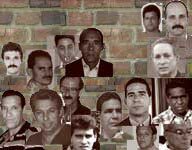 Ever since I started this blog, I have felt it vital to remember their names, names the regime would rather have the world never know. That is the only way to fully grasp the injustices they are suffering. Today's prisoners are Lewis Arce Romero, Lazaro Avila Sierra and Francisco Reyes Rodríguez, who in 2003 were convicted of terrorism-related charges and sentenced to life in prison after plotting -- but not carrying out -- the hijacking of an airplane. They may not be considered typical "political prisoners," but the human rights commission does include them on its list.